Black-framed windows and a 19th-century brick façade ensure that this Beacon Hill abode fits in perfectly with its historical neighbors. But its outward appearance conceals exciting modern design within. 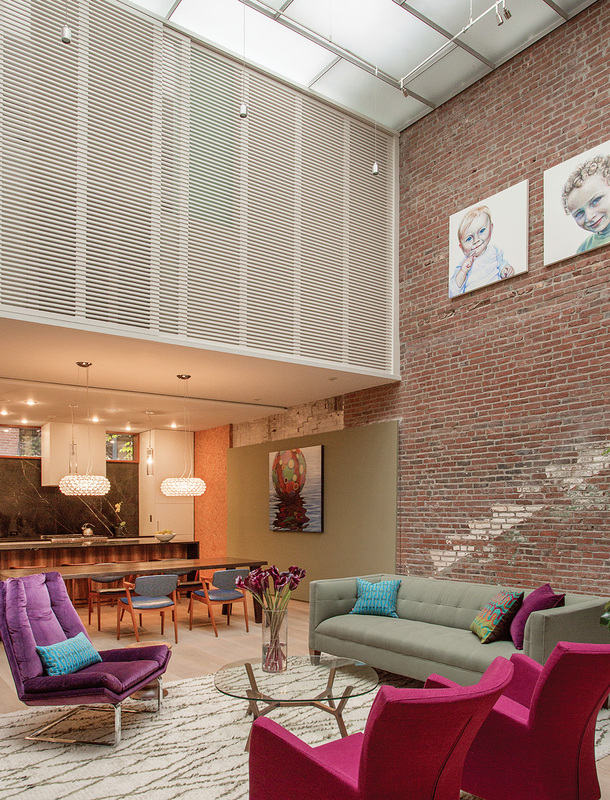 In fact, it’s been radically transformed more than once: Originally a stable, it was converted in 1916 from a shop into a residence for Boston attorney Edward Noyes. When completed, the home was featured in House Beautiful, which lauded the Italy-inspired central courtyard and the “living hall’s” brick floor and walls. The photos accompanying the article revealed the home’s lavish interiors, outfitted with elaborate brocade tapestries, 14th-century antiques, and fireplaces with enormous stone hearths. A century later, you’d never know it was the same place. 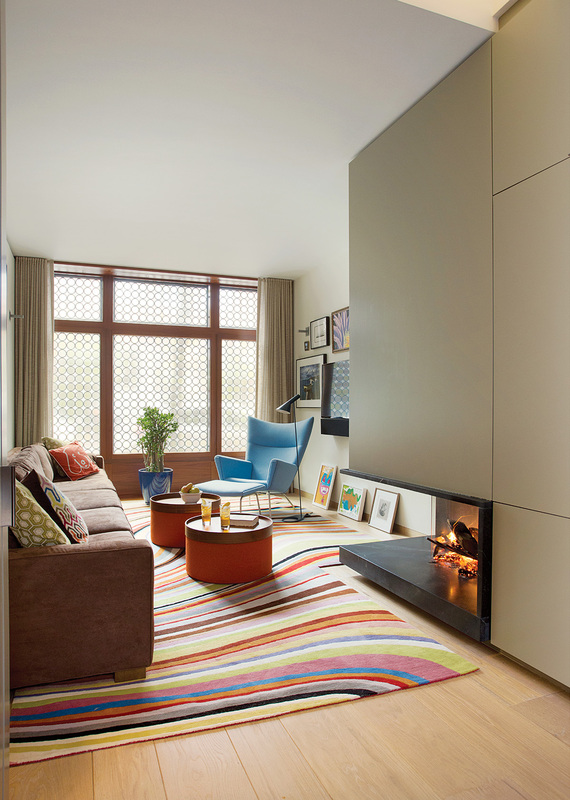 Streamlined and bright, the townhouse’s interiors are completely contemporary and furnished with modern accents. The homeowners, a young couple with three young children, came upon the house after much searching. 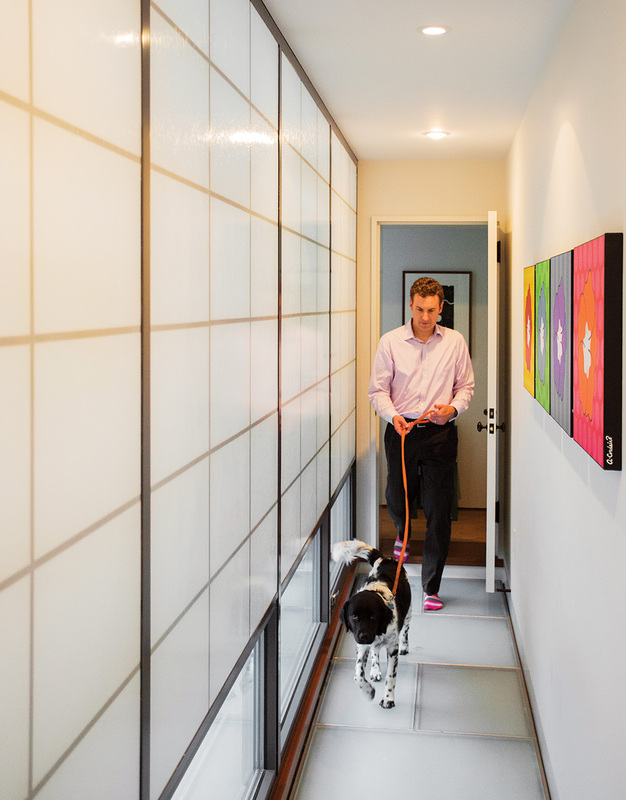 “We liked modern interiors,” says the husband, “but we also wanted to be in a nice neighborhood.” Beacon Hill’s tight-knit community appealed to them, yet it wasn’t exactly a hotbed of contemporary design. Well versed in design, the husband blocked out the house in SketchUp to make sure it could accommodate the needs of the couple’s growing family. “It was important to have wide-open spaces, as well as places other than bedrooms where we could get away,” he says. 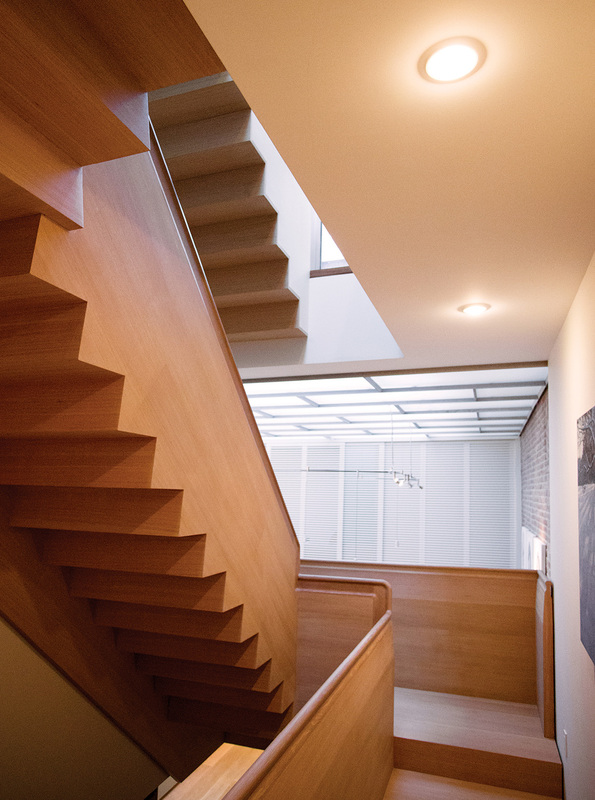 Getting light into the home’s interiors presented the biggest challenge: The 68-foot-deep building has a zero-lot-line, meaning that it extends to the edge of the property and lacks outdoor space at ground level. “There’s no parking and no yard whatsoever,” Butz says. 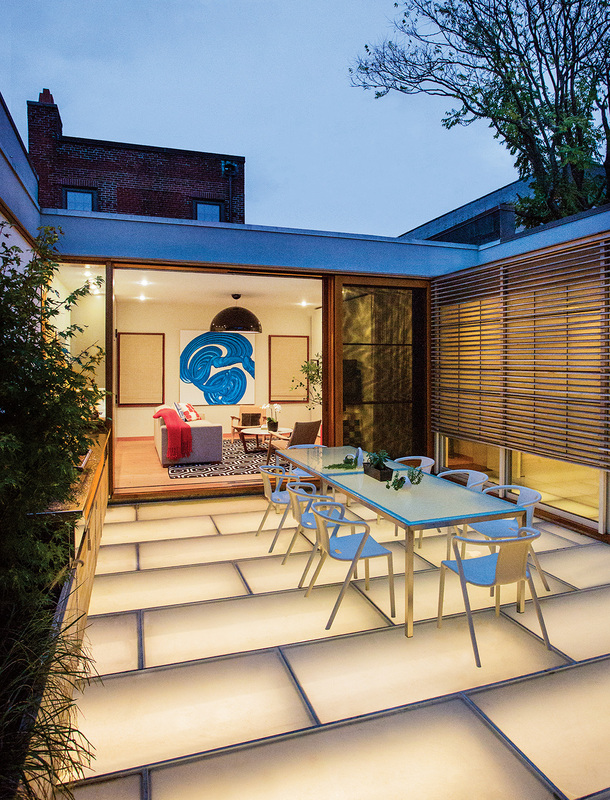 For a solution, the architects looked up—to the house’s large skylight. What if it became a floor of sandblasted glass? Created by Florida-based Circle Redmont, it would allow natural light from above to penetrate deep into the home’s interior. 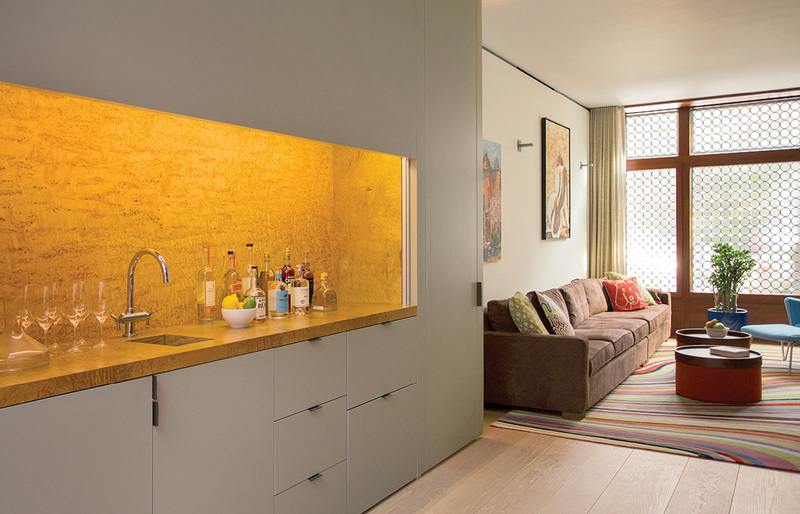 The courtyard’s ample outdoor kitchen is serviced by a dumbwaiter—dishes and foods prepared below can be easily transported among the home’s levels. Up one more flight is an outdoor roof deck. 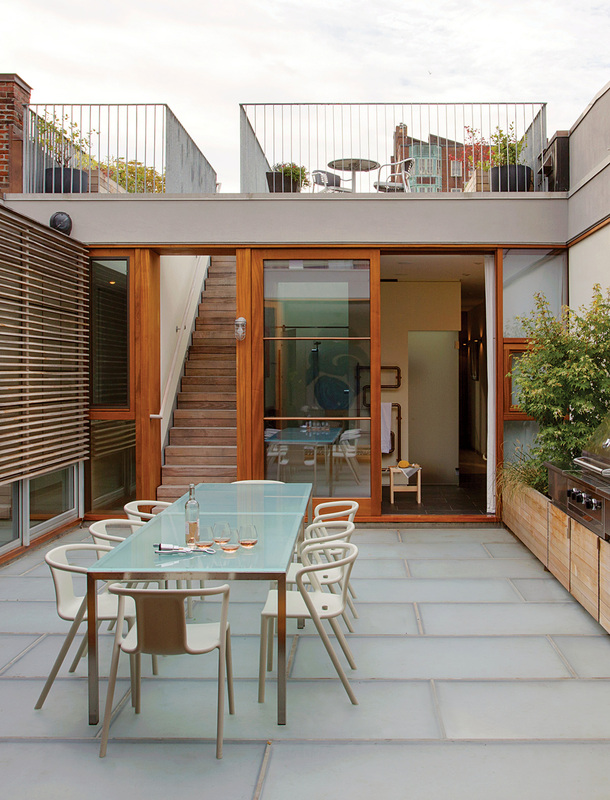 Directly below the glass-floored courtyard is a generous, double-height living space with a wall of built-in cabinetry that houses everything from the HVAC systems to the kitchen fridge and pantry; it even contains a handy desk area. 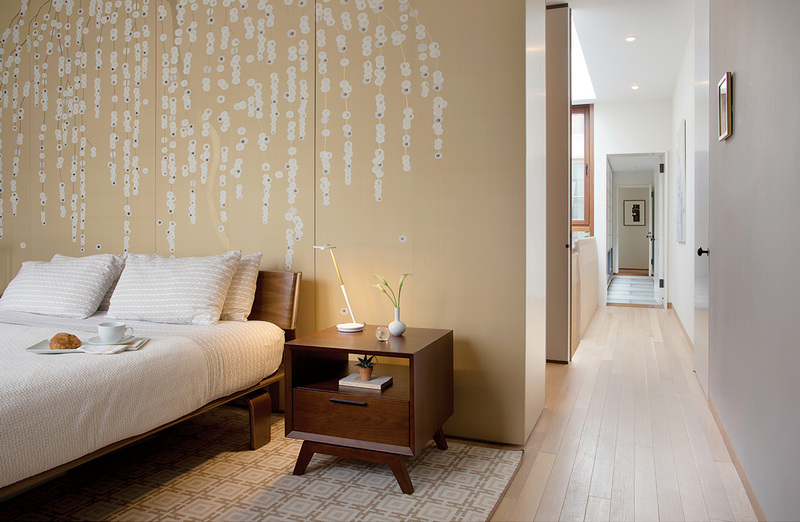 “The key to making simple contemporary interiors is you need to have space to keep stuff,” Butz says. Overlooking this grand living space is the homeowners’ office, which can be fully enclosed by louvered panels and sliding-glass partitions. The kids’ bathroom, with its sandblasted-and-etched-glass interior window, is on the opposite side. Beyond are three modest bedrooms for the children. 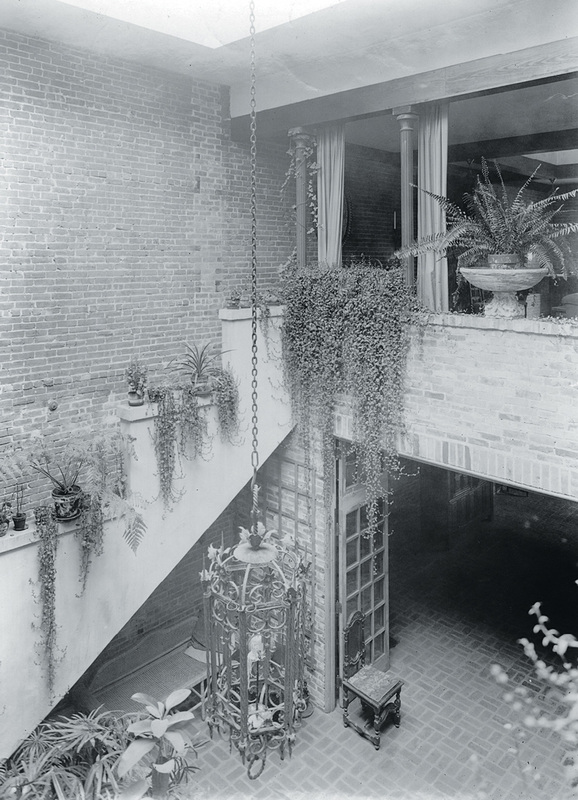 “The owners preferred that the public spaces be large, open, and generous, so bedrooms could be small,” Klug says. 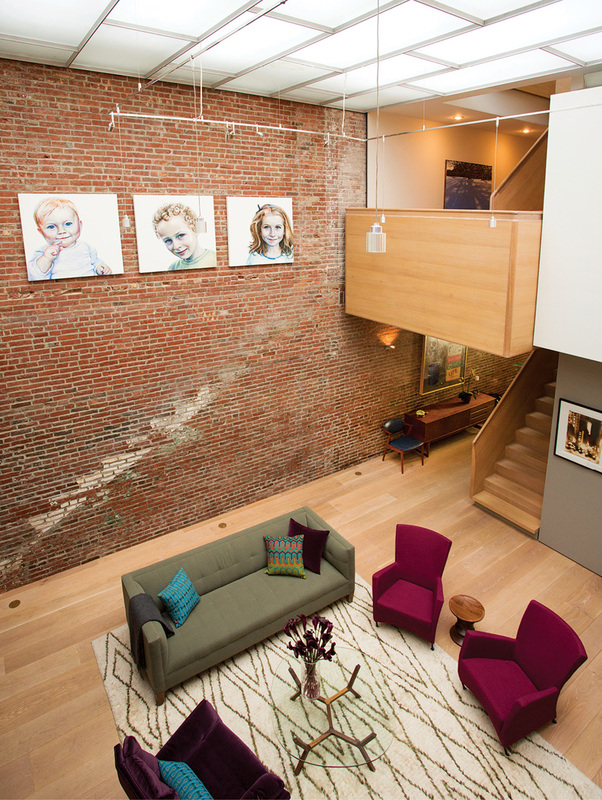 With three young kids, the owners wanted interiors geared for everyday living. 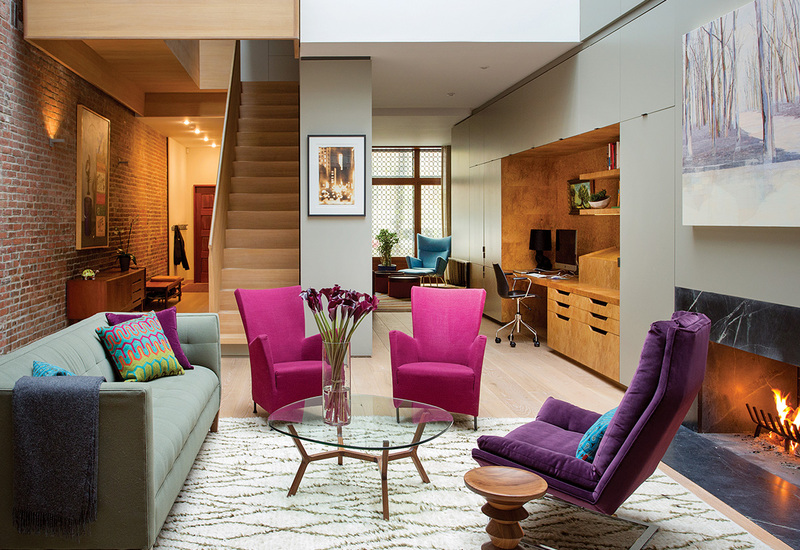 Interior designer Rachel Reider worked to devise a warm and comfortable modern aesthetic, punctuated by bright colors. 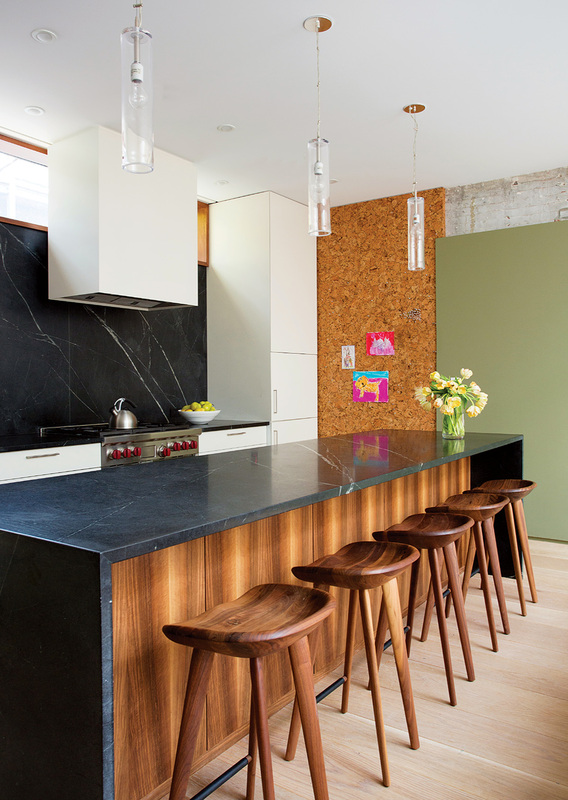 “The rich jewel tones add energy to the space,” Reider says. In the living room, a vintage purple chair found at Machine Age is paired with a deep-pink Gijs Papavoine chair and a Mitchell Gold + Bob Williams sofa. “One of our focuses was to create very soft upholstered pieces to balance some of the architecture’s harder surfaces,” says Reider, who also designed a custom 120-inch-long walnut dining table built by Holmes Fine Furniture, suited to the family’s frequent dinner parties. 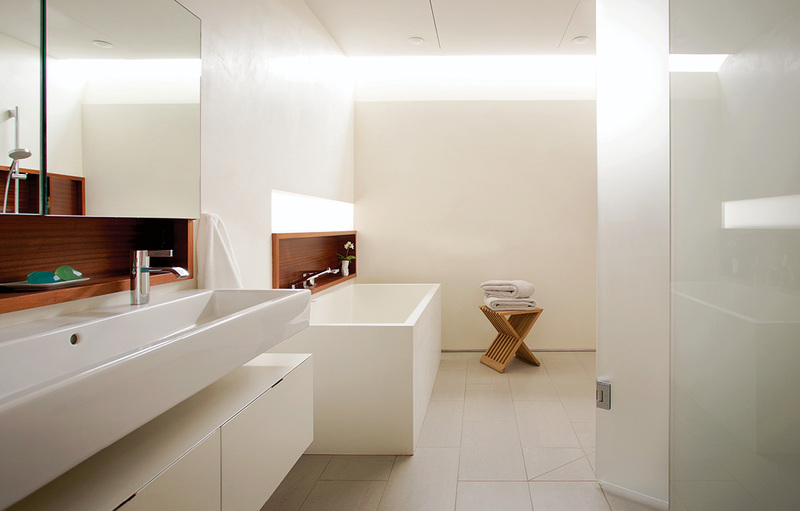 Inspired by their travels to Japan, the homeowners sought to emulate a bathroom they relished during a stay at an inn in Kyoto. 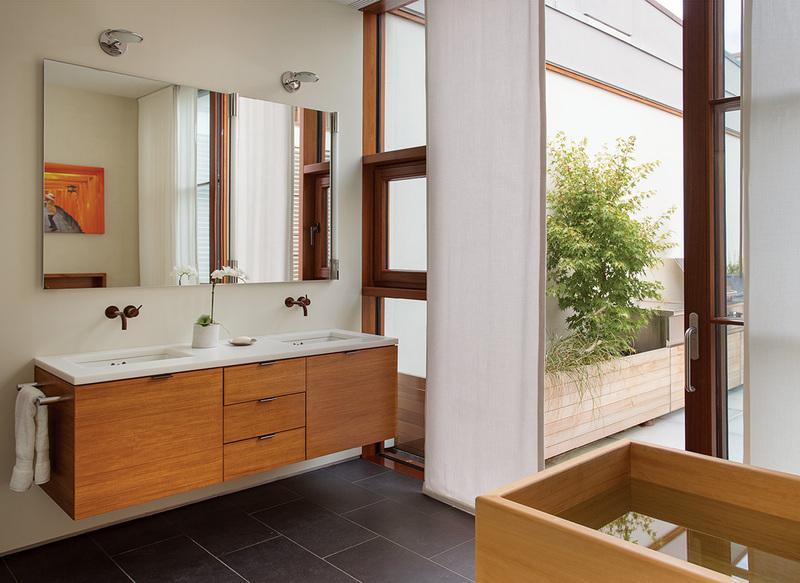 To evoke an Asian feel in the couple’s slate-floored master bathroom, Butz + Klug designed a teak soaking tub fitted with copper fixtures. 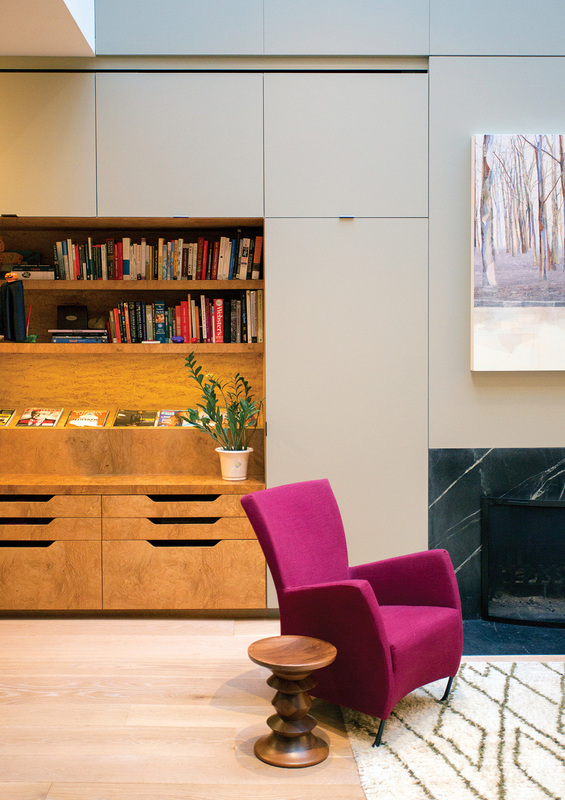 A street-level family room feels very modern—yet its proportions and details echo the home’s former spaces. With an original leaded-glass window looking out over the street, it’s a lovely feature that pays homage to the past, concealing the wondrous modern spaces within.